Louis XVIII, Louis le Désiré, Louis-Stanislas-Xavier, comte de Provence, third son of the dauphin Louis, son of Louis XV, and of Maria Josepha of Saxony, was born at Versailles on the 17th of November 1755. His education was supervised by the devout duc de la Vauguyon, but his own taste was for the writings of Voltaire and the encyclopaedists. On the 14th of May 1771 took place his marriage with Louise-Marie-Josephine of Savoy, by whom he had no children. His position at court was uncomfortable, for though ambitious and conscious of possessing greater abilities than his brother Louis XVI, his scope for action was restricted; he consequently devoted his energies largely to intrigue, especially against Marie Antoinette, whom he hated. During the long absence of heirs to Louis XVI, "Monsieur", as heir to the throne, courted popularity and took an active part in politics, but the birth of a dauphin (1781) was a blow to his ambitions. He opposed the revival of the parlements, wrote a number of political pamphlets, and at the Assembly of Notables presided, like the other princes of the blood, over a bureau, to which was given the name of the Comité des sages; he also advocated the double representation of the tiers. At the same time he cultivated literature, entertaining poets and writers both at the Luxembourg and at his château of Brunoy, and gaining a reputation for wit by his verses and mots in the salon of the charming and witty comtesse de Balbi, one of Madame's ladies, who had become his mistress, and until 1743 exerted considerable influence over him. He did not emigrate after the taking of the Bastille, but, possibly from motives of ambition, remained in Paris. Mirabeau thought at one time of making him chief minister in his projected constitutional government, but was disappointed by his caution and timidity. The affaire Favras (December 1789) aroused great feeling against Monsieur, who was believed by many to have conspired with Favras, only to abandon him. In June 1791, at the time of the flight to Varennes, Monsieur also fled by a different route, and, in company with the comte d'Avaray -- who subsequently replaced Mme. de Balbi as his confidant, and largely influenced his policy during the emigration -- succeeded in reaching Brussels, where he joined the comte d'Artois and proceeded to Coblenz, which now became the headquarters of the emigration. Here, living in royal state, he put himself at the head of the counter-revolutionary movement, appointing ambassadors, soliciting the aid of the European sovereigns, and especially of Catherine the Great of Russia. Out of touch with affairs in France and surrounded by violent anti-revolutionists, headed by Calonne and the comte d'Artois, he followed an entirely selfish policy, flouting the National Assembly, issuing uncompromising manifestoes, and obstructing in every way the representatives of the king and queen. After Valmy he had to retire to Hamm in Westphalia, where, on the death of Louis XVI, he proclaimed himself regent; from here he went south, with the idea of encouraging the royalist feeling in the south of France, and settled at Verona, where on the death of Louis XVII (8th of June 1795) he took the title of Louis XVIII. At this time ended his liaison with Mme. de Balbi, and the influence of d'Avaray reached its height. From this time onward his life is a record of constant wanderings, negotiations and conspiracies. In April 1796 he joined Condé's army on the German frontier, but was shortly requested to leave the country, and accepted the hospitality of the duke of Brunswick at Blanckenberg until 1797, when, this refuge being no longer open to him, the emperor Paul I permitted him to settle at Mittau in Courland, where he stayed until 1801. All this time he was in close communication with the royalists in France, but was much embarrassed by the conflicting policy pursued by the comte d'Artois from England, and was largely at the mercy of corrupt and dishonest agents. At Mittau was realized his cherished plan of marrying Madame Royale, daughter of Louis XVI, to the duc d'Angoulême, elder son of the comte d'Artois. From Mittau, too, was sent his well-known letter to Bonaparte (1799) calling upon him to play the part of Monk, a proposal contemptuously refused, though Louis in turn declined to accept a pension from Bonaparte, and later, in 1803, though his fortunes were at their lowest ebb, refused to abdicate at his suggestion and accept an indemnity. Suddenly expelled from Mittau in 1801 by the capricious Paul I, Louis made his way, in the depth of winter, to Warsaw, where he stayed for three years. All this time he was trying to convert France to the royalist cause, and had a "Conseil royal" in Paris, founded at the end of 1799 by Royer-Collard, Montesquiou and Clermont-Gallerande, the actions of which were much impeded by the activity of the rival committee of the comte d'Artois, but after 1800, and still more after the failure of the royalist conspiracy of Cadoudal, Pichegru and Moreau, followed by the execution of the duc d'Enghien (March 1804), and the assumption by Napoleon of the title of emperor (May 1804), the royalist cause appeared quite hopeless. In September 1804 Louis met the comte d'Artois at Calmar in Sweden, and they issued a protest against Napoleon's action, but being warned that he must not return to Poland, he gained permission from Alexander I again to retire to Mittau. After Tilsit, however (1807), he was again forced to depart, and took refuge in England, where he stayed first at Gosfield in Essex, and afterwards (1809 onwards) at Hartwell in Buckinghamshire. In 1810 his wife died, and in 1811 d'Avaray died, his place as favorite being taken by the comte de Blacas. After Napoleon's defeats in 1813 the hopes of the royalists revived, and Louis issued a fresh manifesto, in which he promised to recognize the results of the Revolution. Negotiations were also opened with Bernadotte, who seemed willing to support his cause, but was really playing for his own hand. In March 1814 the Allies entered Paris, and thanks to Talleyrand's negotiations the restoration of the Bourbons was effected, Louis XVIII entering Paris on the 2nd of May 1814, after issuing the declaration of St. Ouen, in which he promised to grant the nation a constitution (octroyer une charte). He was now nearly sixty, wearied by adversity, and a sufferer from gout and obesity. But though clear-sighted, widely read and a good diplomatist, his impressionable and sentimental nature made him too subject to personal and family influences. His concessions to the reactionary and clerical party of the émigrés, headed by the comte d'Artois and the duchesse d'Angoulême, aroused suspicions of his loyalty to the constitution, the creation of his Maison militaire alienated the army, and the constant presence of Blacas made the formation of a united ministry impossible. After the Hundred Days, during which the king was forced to flee to Ghent, the dismissal of Blacas was made one of the conditions of his second restoration. On the 8th of July he again entered Paris, "in the baggage train of the allied armies", as his enemies said, but in spite of this was received with the greatest enthusiasm by a people weary of wars and looking for constitutional government. He was forced to retain Talleyrand and Fouché in his first ministry, but took the first opportunity of ridding himself of them when the elections of 1815 assured him of a strong royalist majority in the chamber (the chambre introuvable, a name given it by Louis himself). At this time he came into contact with the young comte (afterwards duc) Decazes, prefect of the police under Fouché, and minister of police in Richelieu's ministry, who now became his favorite and gained his entire confidence. Having obtained a ministry in which he could trust, having as members the duc de Richelieu and Decazes, the king now gave it his loyal support and did his best to shield his ministers from the attacks of the royal family. In September 1816, alarmed at the violence of the chambre introuvable, he was persuaded to dissolve it. An attempt on the part of the Ultras to regain their ascendancy over the king, by conniving at the sudden return of Blacas from Rome to Paris, ended in failure. It may be said that the king's policy throughout his reign was one of prudence and common sense. His position was more passive than active, and consisted in giving his support as far as possible to the ministry of the day. While Decazes was still in power, the king's policy to a large extent followed his, and was rather liberal and moderate, but after the assassination of the duc de Berry (1820), when he saw that Decazes could no longer carry on the government, he sorrowfully acquiesced in his departure, showered honors upon him, and transferred his support to Richelieu, the head of the new ministry. In the absence of Decazes a new favorite was found to amuse the king's old age, Madame du Cayla (Zoé Talon, comtesse du Cayla), a protegée of the vicomte Sosthène de la Rochefoucauld and consequently a creature of the Ultras. As the king became more and more infirm, his power of resistance to the intrigues of the Ultras became weaker. 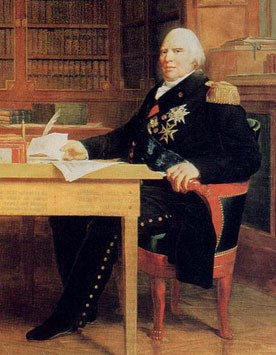 The birth of a posthumous son to the duc de Berry (September 1820), the death of Napoleon (5th of May 1821) and the resignation of Richelieu left him entirely in their hands, and after Villèle had formed a ministry of a royalist character the comte d'Artois was associated with the government, which passed more and more out of the king's hands. He died on the 16th of September 1824, worn out in body, but still retaining flashes of his former clear insight and skepticism. The character of Louis XVIII may be summed up in the words of Bonaparte, quoted by Sorel, "C'est Louis XVI avec moins de franchise et plus d'esprit." He had all the Bourbon characteristics, especially their love of power, combined with a certain nobility of demeanor, and a consciousness of his dignity as king. But his nature was cold, unsympathetic and calculating, combined with a talent for intrigue, to which was added an excellent memory and a ready wit. An interesting judgment of him is contained in Queen Victoria's Letters, in a letter of Leopold I, king of the Belgians, to the queen before her accession, dated the 18th of November 1836, "Poor Charles X is dead... History will state that Louis XVIII was a most liberal monarch, reigning with great mildness and justice to his end, but that his brother, from his despotic and harsh disposition, upset all the other had done and lost the throne. Louis XVIII was a clever, hard-hearted man, shackled by no principle, very proud and false. Charles X an honest man, a kind friend", etc. etc. This seems fairly just as a personal estimate, though it does not do justice to their respective political roles.